I used the standard deviation symbol in the lesson about calculating z-score. There are a few ways you can add this symbol to an Excel spreadsheet. Click Insert >> Symbols >> Symbol. A new window will appear. 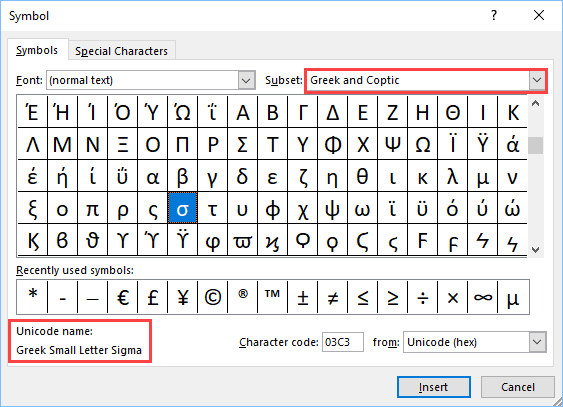 Because sigma (standard deviation symbol) is a Greek letter, in the subset, check Greek and Coptic. Click Insert to place the number. You can add more than one number this way – one after another. Click Close to close this windows. Sigma symbol is now present on the sheet. This method can be faster because it will allow you to search for a particular word. In Windows 7, you can find Character Map in Start >> All Programs >> Accessories >> System Tools >> Character Map. 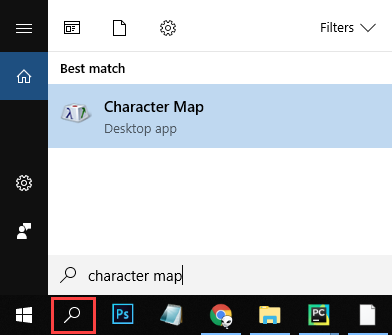 In Windows 10, you can type “Character Map” inside the search window in the bottom-left corner. A new window will appear. you can find sigma inside this list. But this is not a good idea – the list is huge. A better way to do this is to click the Advanced view checkbox. 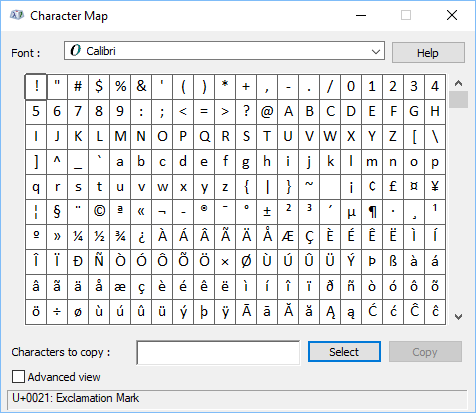 The Character Map window will expand, and you have an option to search for a particular phrase. Because we search for sigma, insert this work inside the textbox. Because there are many characters inside the character list, and the word sigma wasn’t precise enough you will receive a list of characters, where you have to choose one. We are searching for a small sigma, so this is the following character. You found the character. Now, you have to copy it. Under Characters to Copy click Select. Now, the selected character is ready to copy with the Ctrl + C keyboard shortcut. In order to paste the character into Excel, press Ctrl + V.